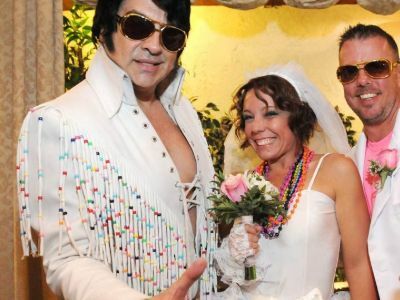 Las Vegas Elvis weddings are something that never goes out of fashion! 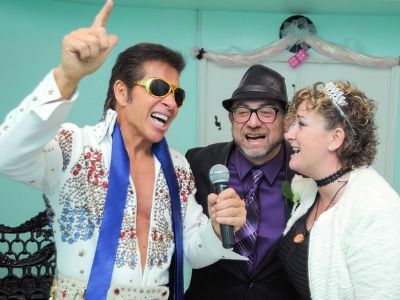 The legacy of The King of Rock And Roll lives on in our hearts and minds, and many couples rightfully consider getting married by an Elvis impersonator a superb idea. 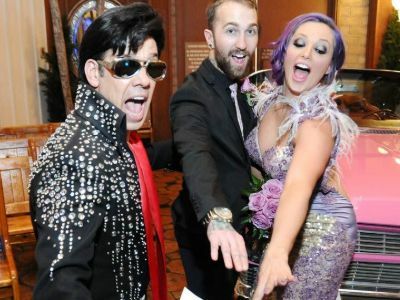 While it's super easy to find an Elvis themed wedding package in the Sin City, here are a few of the best ones I selected. 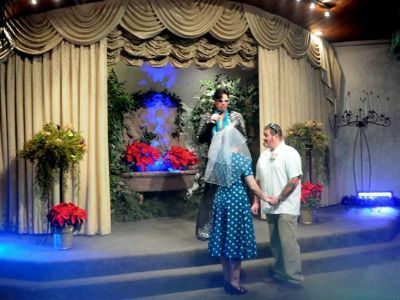 The Las Vegas Elvis Wedding at Graceland Chapel is one of the most popular ways for couples to enjoy their wedding day. For over 50 years, the Graceland Wedding Chapel is a special place where many celebrities like Johnny Depp and Jay Leno have tied the knot. There are two special packages for couples to choose for their ceremony with each boasting a luxurious limousine ride to and from the Graceland Wedding Chapel. Couples will be greeted by a coordinator and a photographer once at the chapel with flowers. From there Elvis will walk the bride down the aisle and sing several songs before, during and after the ceremony. The ceremony will be performed by a qualified minister with Elvis as one of your witnesses. When your ceremony is finished couples will receive a commemorative DVD for future viewing. The Las Vegas Elvis Wedding Ceremony is one of the more unique ways for couples to tie the knot. There are six packages available to couples that range from a variety of photographs to the number of songs by Elvis to how many Elvis’s you wish to perform during your ceremony. Start your day with being picked up at your hotel in a luxurious limousine which will take you to the wedding chapel. Once the couple arrives they are greeted by Elvis and the couple will be given wedding flowers to wear. After the King of Rock and Roll walks the bride down the aisle, Elvis will serenade the future couple with a number of preselected songs before, during and after the ceremony. Onsite photographers, coordinators and ministers will make your ceremony the perfect day to remember. Friends and family are invited to watch live webcam streaming of your special day. When the ceremony is over the couple is whisked away to their hotel in a luxurious limousine. 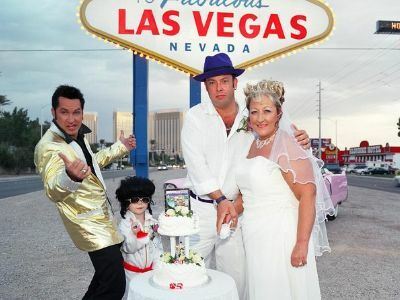 If you are looking for an easy and less stressful way to get married or renew your vows while in Sin City, then you should book the Pink Cadillac Wedding or Vow Renewal Ceremony at the Las Vegas Sign with Elvis. Your 2-hour marriage adventure starts when Elvis shows up at your hotel in a 1955 Pink Cadillac. From here you will have a chance to chat with Elvis as you drive to one of the most famous places in in Sin City, the Welcome to Fabulous Las Vegas Sign. Once at the sign a professional photographer will take some outstanding photographs of you and your loved one before Elvis sings a lovely song of your choice. Elvis will oversee your ceremony and he will sign your marriage license after your wedding or wedding vow renewal is complete. Before you are transported back to your hotel in the Pink Cadillac, the King will belt out another scintillating love song of your choice. Bonuses included in this wedding ceremony include ten hi-resolution photographs for you to keep and you get to pick the two songs Elvis will sing for you. 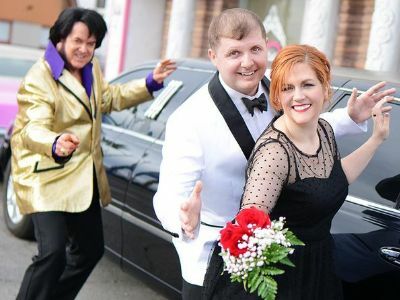 Elvis still reigns in Sin City and couples looking to have Elvis oversee their weeding should try the Las Vegas Elvis Wedding at the Little Chapel including Limousine Transportation. Your 2-hour journey into matrimony begins with complimentary hotel pick-up service where you will be transported to the Little Vegas Chapel by limousine. When you arrive at the chapel Elvis will be waiting along with a professional photographer who will take numerous photos of your special day for you to take with you when you leave. Before your ceremony begins Elvis will appear and serenade you down the aisle where you will listen to a special vow ceremony performed by Elvis himself. 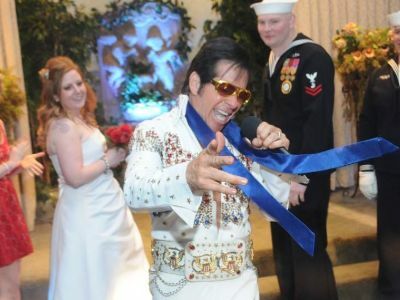 After you exchange your special vows of matrimony that the King crafted just for you, Elvis will once again serenade you into a blissful state of happiness as you saunter back down the aisle. Bonuses with this wedding package include flowers and a video recording of your ceremony. Your special wedding day concludes with a limousine ride back to your Las Vegas hotel. 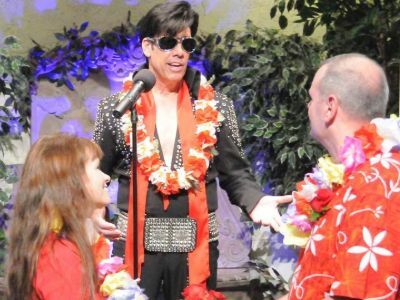 The Elvis Blue Hawaii wedding package combines the tropical beauty of Hawaii with an Elvis wedding in Las Vegas for a fun and enjoyable wedding experience. This wedding package includes beautiful lighting, a Hula Dancer and the ceremony is performed by Elvis. The stage is set with tropical palm trees and clear blue skies that bring in a cheerful and fun vibe. Guests are welcome to wear Hawaiian shirts and sarong to blend in with the setting. Elvis performs the Hawaiian themed wedding song and some of his other popular tunes to entertain the bride and groom and the wedding guests. 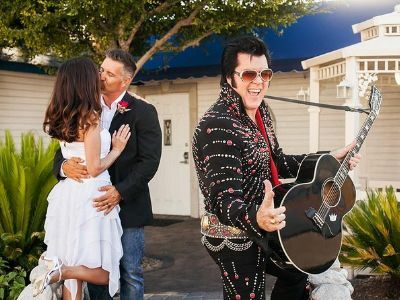 With the Devil in Disguise Elvis package, couples will have not just a simple Elvis wedding in Las Vegas, but so much more! The ceremony is performed at a special Elvis wedding chapel and the entire theme of the wedding revolves around The King. The groom himself can rent the Elvis costume for the wedding and guests can choose from a number of different fun costumes available on location. The ceremony is performed by Elvis who also performs songs. The package includes everything from wedding website and invitations to bridal bouquets and professional photography. The Elvis in Concert package is the ultimate treat for Elvis fans. Other than the beautiful Elvis wedding in Las Vegas, couples will enjoy a private concert where they can enjoy him performing some of his most popular tracks. This wedding package offers couples a touching ceremony with a beautiful ballad when the bride walks down the aisle, songs during the exchange of rings and vows as well as an impressive performance after the wedding that will get the bride and groom dancing and enjoying this special day in their life. Celebrate your Elvis wedding in Las Vegas in true style with a 1964 convertible pink caddy! The Elvis Pink Caddy wedding package will have couples and guests celebrating in true enthusiasm. The bride and groom arrive at the ceremony location in the beautiful pink Cadillac driven by Elvis. The car drives right into the building with family and friends looking on and cheering the couple. The wedding venue itself is appropriately decorated with theatrical lighting, sound, fog and performance by Elvis. With the Visions from the King wedding package, couples exchange their vows in the beautifully candlelit Elvis wedding chapel. To make this Elvis wedding in Las Vegas even more special, the ceremony will be performed by Elvis himself! This wedding package is suitable for up to 30 guests and includes entertainment for guests with Elvis performing two of his popular songs.